I first saw the idea of a Christmas book Advent calendar on Pinterest and I thought it was a great idea! But I had to make my own list. I’m not anti-Santa but he’s never been a major part of our Christmas celebration. 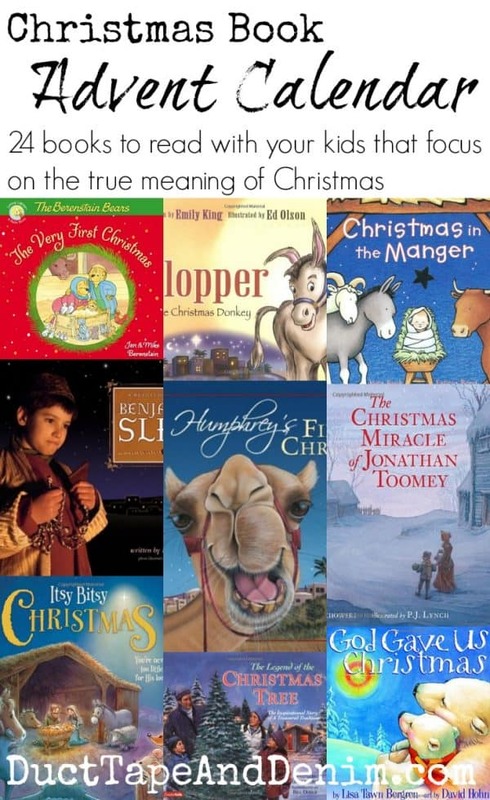 So I thought I’d create a list of Christmas books that focus more on the true meaning of the holiday. The idea is to wrap and number 25 books. 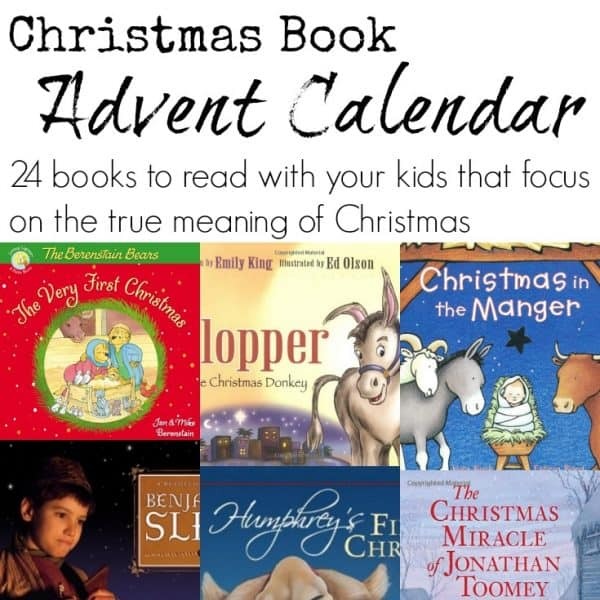 Each night your kids get to unwrap a new Christmas story to read together as a family. If you decide to do this please don’t think you have to go out and buy 25 books all the first year. Start with what you have and add a couple of books every year. You could even wrap library books… as long as you remember where they are before they’re due! Clopper the Christmas Donkey – This has become a tradition for us at our church. The kids LOVE Clopper! Benjamin’s Sling – The story of a shepherd boy in Bethlehem. The Berenstain Bears, The Very First Christmas – You know how much I love those bears!!! They made my list of favorite Thanksgiving books, too. The Christmas Miracle of Jonathan Toomey – How carving a creche changed a wood carvers life. Itsy Bitsy Christmas: You’re Never Too Little for His Love – I know you couldn’t wrap it but this one’s only $1.99 on Kindle! God Gave Us Christmas – I’ve heard parents say they like this book because it talks about the true meaning of Christmas without spoiling Santa. The Gift of the Christmas Cookie: Sharing the True Meaning of Jesus’ Birth – A family share Christmas cookies with others. Christmas Day in the Morning – A boy finds something special to give his father, without spending any money at all. Christmas Farm – A sweet story of a woman and little boy who plant and care for 600 Christmas trees on their farm. The Legend of the Christmas Tree – How the tradition of the Christmas tree began. Goodnight Manger – Who knew a manger could be so loud? Song of the Stars: A Christmas Story – Faithful to the text, this book tells more than just the Christmas story. It also describes how all creation was waiting for Him. Humphrey’s First Christmas – A fun retelling of the Christmas story. Told by one of the wise men’s camels! Mortimer’s Christmas Manger – The story of a little mouse who moves into a manger scene. The Little Drummer Boy – Beautifully illustrated by Ezra Jack Keats! The Little Shepherd’s Christmas – Told from the viewpoint of a young shepherd boy. Christmas in the Manger – A board book illustrated by Felicia Bond. A Night Like No Other – A toy soldier discovers that he should listen to his Creator. Who is Coming to Our House? – The animals get their home ready to share with Baby Jesus. The Pine Tree Parable – I’ve always like the parable series! The Crippled Lamb – This lamb felt left out but he had a special role this night. Another $1.99 Kindle book! The Animals’ Christmas Eve – A sweet rhyme and counting book. Luke 2 – We begin our Christmas Day celebration by reading Luke 2 straight from the Bible every year. There’s no better book than that! And, just ’cause I love them so much, here’s a whole list of Christmas stories from the Berenstain Bears! The Berenstain Bears and the Joy of Christmas – only $1.99 on Kindle! Thanks for reading my post! Please leave a message if you have or plan to have a Christmas book Advent calendar this year!